"We're on tour with the awesome Tiger Flowers. Make sure you stick around and watch them. 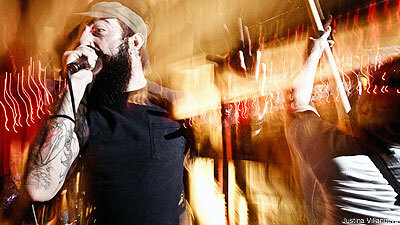 They rip even harder than us," March of Echoes frontman Nicolai said Feb. 18 at The Charleston. Boy, he's not kidding. I've literally seen Tiger Flowers frontman Jesse Madre rip his own shirt off. That's not to say that March of Echoes aren't madmen, either. It's just that their epic soundscapes don't compare to the anger and ironically lovable animosity of Tiger Flowers. "March of Echoes swam all the way over here from Norway," vocalist Jesse Madre said at the beginning of Tiger Flowers set at the Brooklyn basement. It was that kind of a fun and jokey night for all the bands that played: Flourishing, My America, March of Echoes, Tiger Flowers and Meek Is Murder. "We're heading to Virginia tonight. Gonna hit up some Waffle Houses," Madre said. The entire basement cheered. It was like the guy was giving out free candy, or he beat up the class bully. "Yeah! It's the only f---ing reason we tour!" he said with reasonable excitement. As native New Yorkers, the dudes in Tiger Flowers can justifiably be that enthusiastic about cheap, Southern-style food. It just does not exist anywhere in the tri-state area. And if you know of a place, you need to comment right now and let us Noisecreepers know where. To cap off the night, Meek Is Murder played their usual less-than-20-minute set. And by usual, I mean they simultaneously scared and amused everyone at the show. "Does anyone here like Botch?" frontman Mike Keller asked. When there was a weak reply, Meek Is Murder just started playing their version of Botch's 'Japam.' And like there was something inside of Tiger Flowers' Madre that wouldn't let him just stay in the crowd, he ran up for the mic and became the fourth member of Meek Is Murder. Everyone turned 14 again and joined in on the fun. 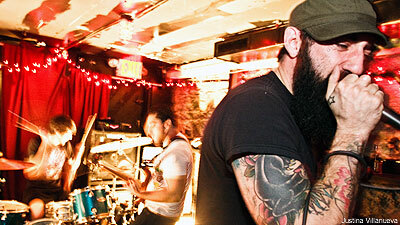 The Tiger Flowers and March of Echoes tour ends Fed. 23 in Philadelphia. New Yorkers will have another chance to see them March 6 at the Cake Shop when they play with Blacklisted, Gods and Queens and Chambers.